I enjoyed attending the April 28th event on the Square in Headland, Alabama. 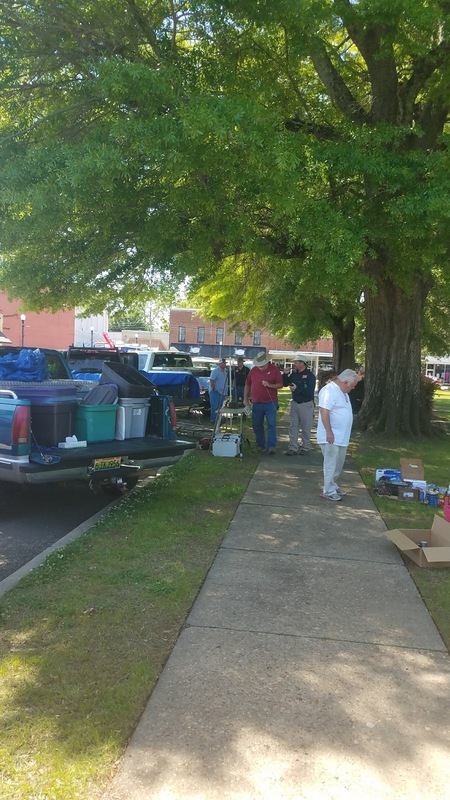 It was an opportunity to visit with Tom WD0HBR and my other ham friends from the Dothan area. I started with breakfast at Hardees at 7 AM and then went over to the site. I brought Suzy with me this year. 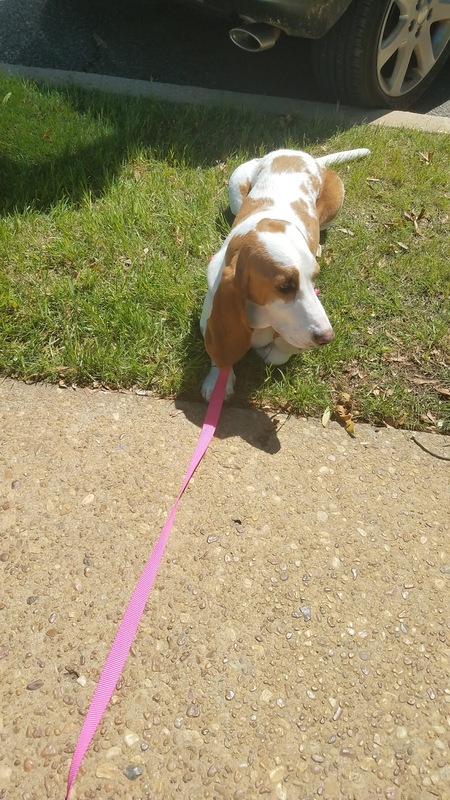 She worked the crowd for belly-rubs. I did not stay for the whole event as I needed to also visit my Mom who lives in Dothan. 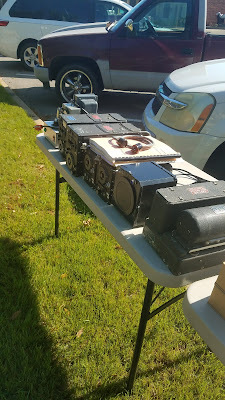 I have been hearing many references to the ARC-5 military line of radios on QSO Today Podcast. 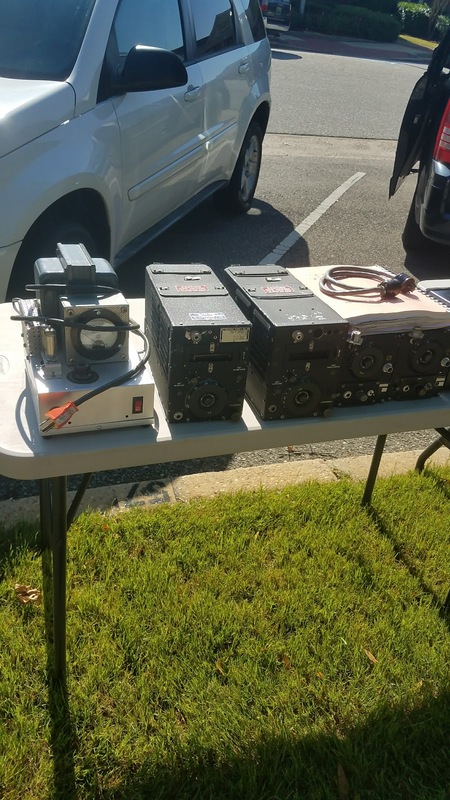 Don K1DC brought his line of ARC-5 gear to sell. It was my first chance to see this famous gear close up. I did not bring it home, but enjoyed the tour by Don. 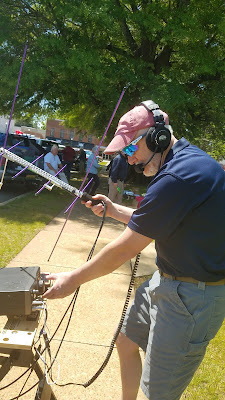 Another friend, Robert KE4AL, brought his Icom 910 rig to do demos for amateur satellites. Robert tunes his rig manually instead of using computer control to adjust for doppler. 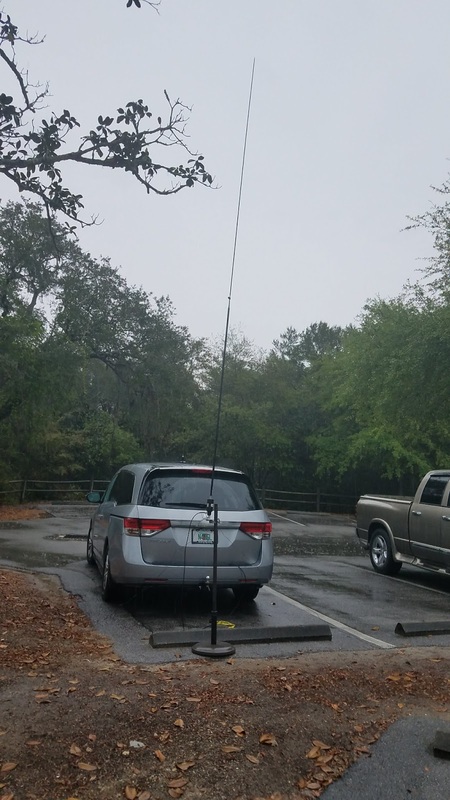 He showed me how it is done on a linear satellite pass. 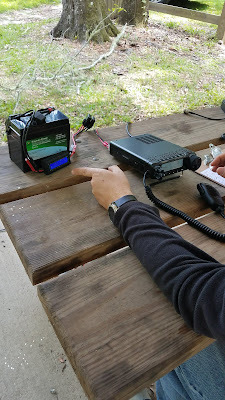 I will try to repeat this technique with my Icom 910. BTW, Robert is going with Matt NJ4Y on July 6-8 to the Dry Tortugas, grid EL84, in the Florida Keys. They will be doing HF and satellites. I usually bring something to demo. 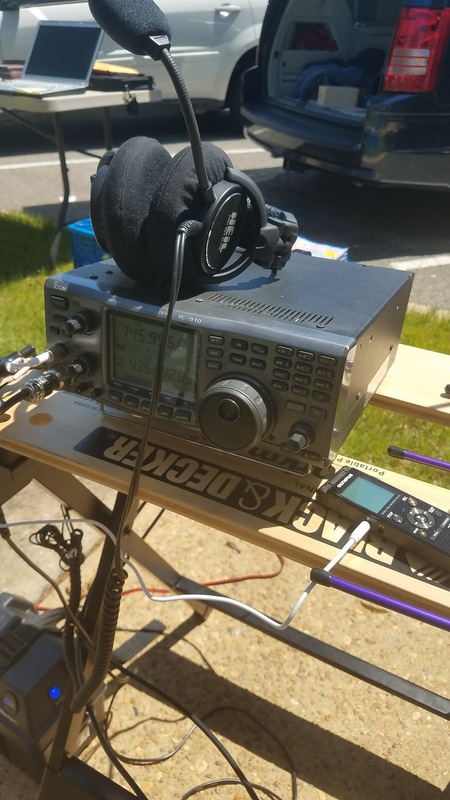 This year, I operated my Elecraft KX2 from a park bench. The rig was setup like an HF HT with a 40 meter MFJ loaded whip and a nine foot counterpoise wire. 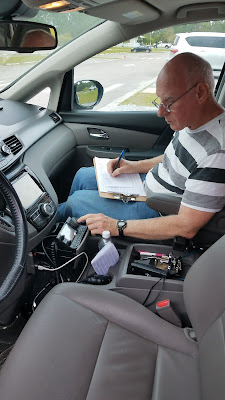 With Tom WD0HBR as my witness, I worked Jim, K4VRT in Tallahassee, Florida. 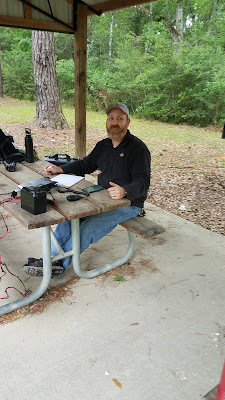 Jim was the net control for the Sunrise Net on 7.123. Jim copied all my info. 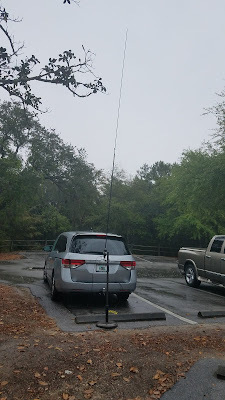 We all know a four foot whip is very inefficient antenna on 40 meters, but you can have success never-the-less. I have to say the social side on amateur radio is a big benefit of the hobby. It was nice to visit with my friends at the Headland Tailgate.on a beautiful April day. Bob KK4DIV and I went to Dead River Landing in Walton, County, FL for QRP To The Field. 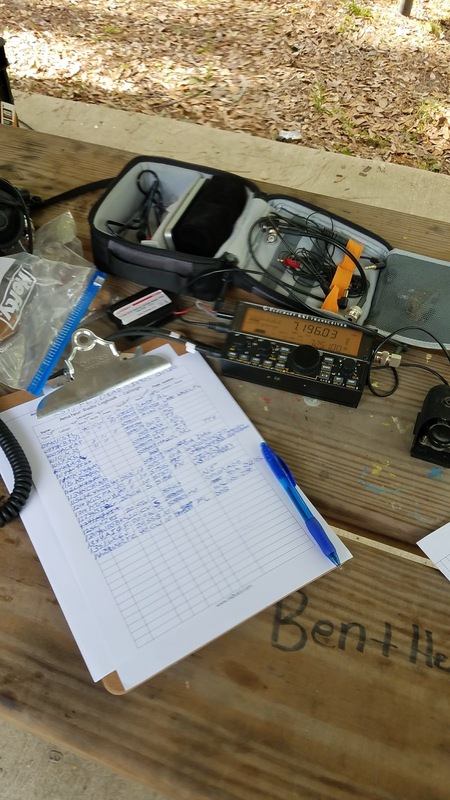 QRPTTF is an annual operating event to encourage QRPers and SOTA stations to get out of the house and operate portable “from the field” or a summit, and of course, have fun. 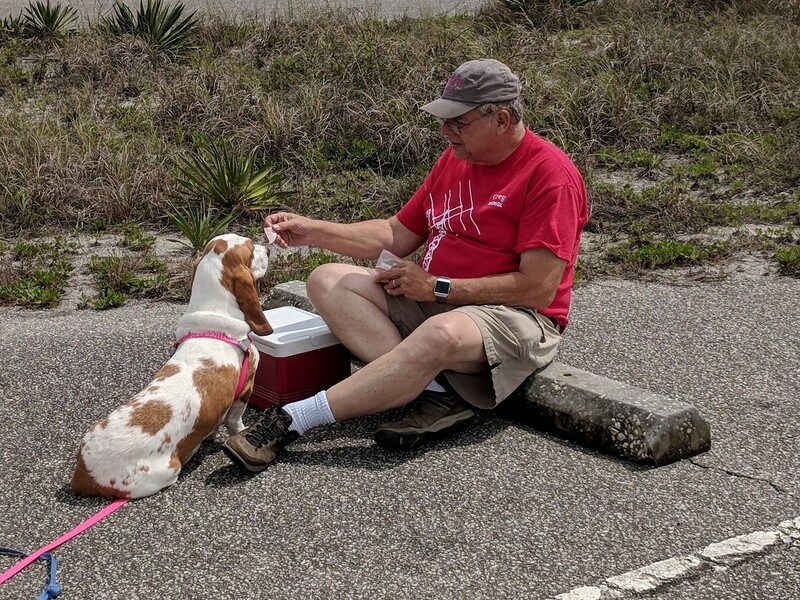 Find a nice operating location for yourself, or combine it with some buddies for a day-long adventure. The theme for this year was "A River Runs Through It". 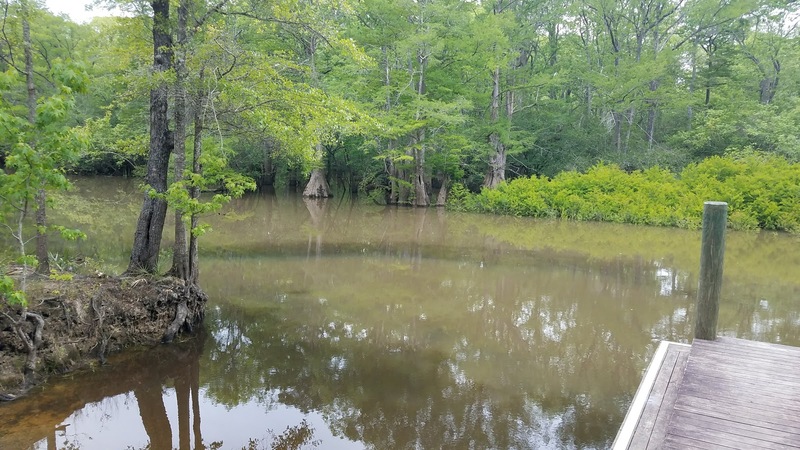 Thus we chose the Dead River Landing on a slough of the Choctawhatchee River. We used Dead River in our exchange. 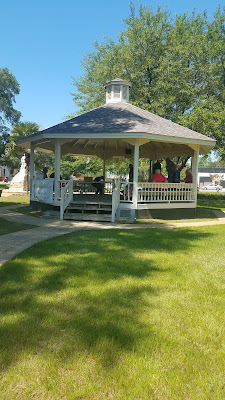 This venue was ideal having a pavilion by the river under oak trees. The oak trees were just the ticket for a 40-meter OCF dipole. 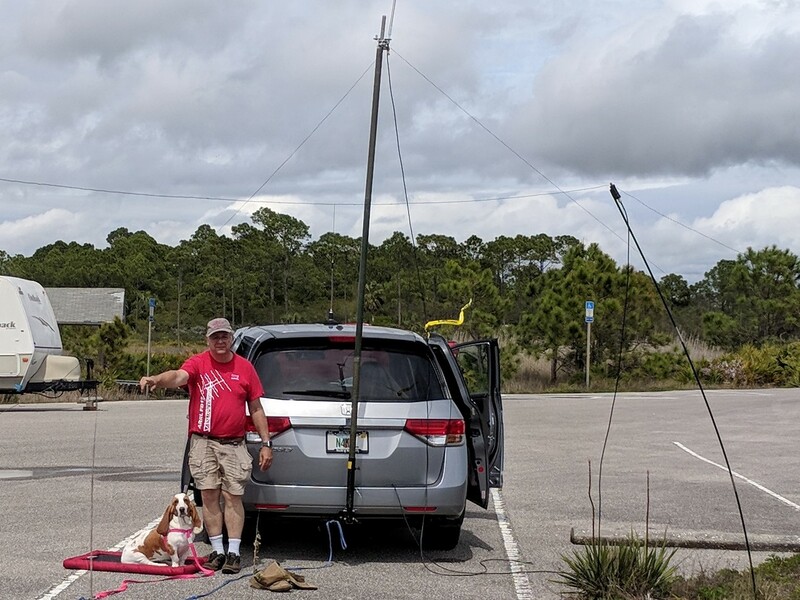 We also had an elevated 20-meter vertical for a while and later traded it for a 20-meter dipole. Bob and I operated under our own calls. 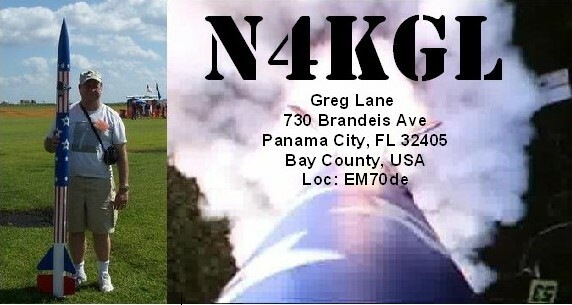 This QRP event was 5 watts CW and 10 watts SSB. Bob works SSB. He used a new Yaesu FT 891. I used the Elecraft KX2. Since we were working concurrently on two bands, interference between the rigs can be an issue. Bob's rig on 20 meters was raising the background noise in my rig of 40 meters. It was an opportunity to use some band-pass filters I purchased from DX Engineering. We put the 40-meter filter on my rig. It did not cure the noise. 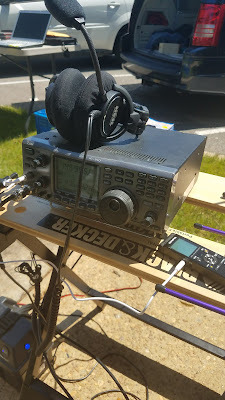 However, putting the 20-meter band-pass filter on Bob's rig cured the noise.This will come in handy for a multiple transmitter Field Day. Bob, Suzy and I had a good time. The weather was comfortable and the river was very scenic. I will definitely add this venue to my list for future operations. 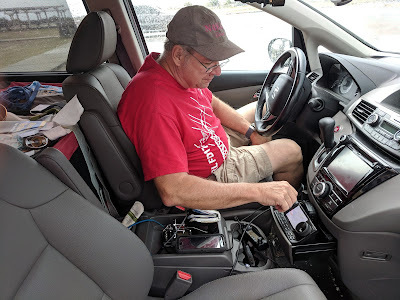 On the return trip, Bob and I listened to the Dennis Blanchard K1YPP QSO Today on which Dennis talks about his 2100 mile hike of the Appalachian Trail. You will find more photos at this link. Although there are times and frequencies listed above, the better way to know where we are is to enter our calls as triggers in HamAlert https://hamalert.org/login Please register and you can also get the HamAlert App for Android. 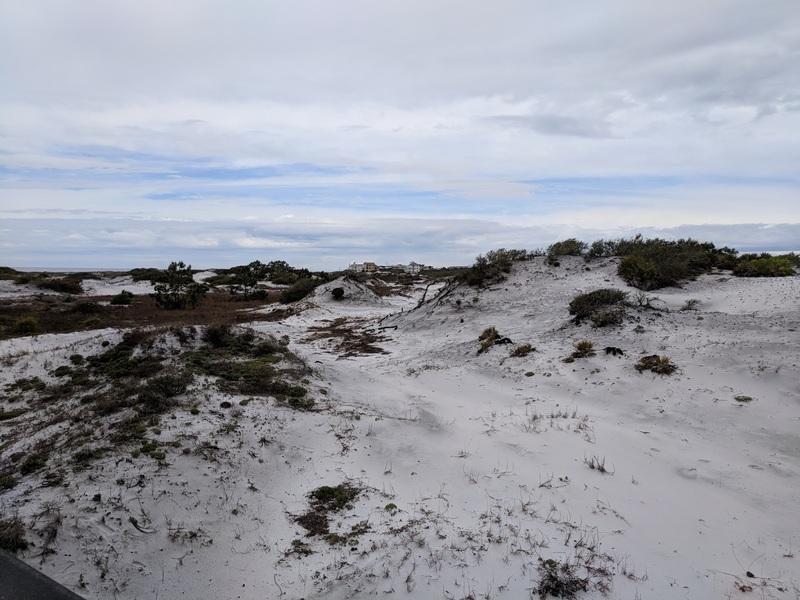 This replaces our previous plan to go to St George Island. Let us know if you will be out portable or chasing.us.